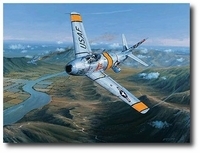 Philip West is recognized as one of the world's finest aviation artists. Collectors of his original oil paintings span the globe, many waiting patiently for his next breathtaking canvas to appear. While jets, and Phantoms in particular, light Philip’s fire, he is also a master painter of piston-engined classics; being renowned for his rendition of Avro Lancasters and Supermarine Spitfires. Philip is also one of the few artists to also enthusiastically paint pictures of Fleet Air Arm aircraft.